We're going to try something a little different for our Fantasy Monday. There will be no more charts, but instead we will put together a line of five players and a goalie who had the best weeks at their positions. McDonald is having a very slow season, but is currently on a three game scoring streak. With 3 goals and 3 assists this week, he led his position in points. The recent addition of Chris Stewart could help McDonald out of his slow season, but don't look for him to return to his 80-point form again. Ovie has been starting to put points together more often these days. 5 points this week (2G, 3A) brought his total to 61 points - still 5 points behind Sidney Crosby who hasn't played in 19 games. Ovie posted 22 shots this week, so he still has the confidence to shoot, but will he reach 35 goals? 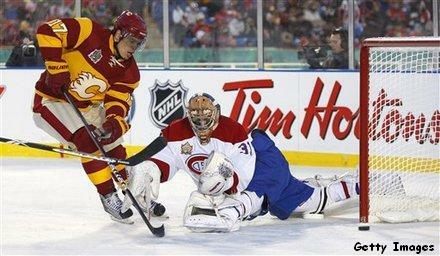 Bourque shined at the Heritage Classic on Sunday, scoring twice on 11 shots, including the game winning goal. Depending on your league's set up, Bourque was your favourite player this week. Along with his game winner, Bourque also assisted on two shorthanded goals. That's quite the week. Yandle increased his lead over the NHL's defence scoring leaders with 1 goal and 4 assists this week. Surprisingly, Yandle did not register a powerplay point, but he was a +6 which is huge if you have him on your squad. Yandle will definitely deserve some Norris talk this season if he keeps it up. The emergence of Pietrangelo on the St.Louis blueline made it possible for GM Doug Armstrong to trade away their top two defencemen this week, Eric Brewer and Erik Johnson. Pietrangelo had 6 assists this week, including 4 on the powerplay. Look for his offense to increase with his confidence. This was a tough call to make, as Antti Niemi and Johan Hedberg both had similar stats, but Kipper gets it for posting a shutout in -20 weather at the Heritage Classic. Kipper led the Flames with 3 wins this week and a 0.98 GAA and .963 SV%. The Flames are in tight for the playoffs in the Western Conference, and with that many teams competing, consistency is key. If Kipper can keep it together for the rest of the seasons, Calgary will make the playoffs. In the West, going to go with Chris Stewart who has been pretty close to a point per game player this year. After the big trade a few days ago Stewart scored 2 goals for the Blues, who have 5 games this week. In the East, going to go with Steven Stamkos who has 3 games this week but I am also taking a shot with Phil Kessel. The Leafs have 4 games this week and Phil is on one of his hot streaks. Keith Yandle is on fire and I am going to stay with him for my D pick in the West. The Yotes have 4 games against PHI, TB, CBJ and CHI. And in the East going to go with Kris Letang who has 4 games this week against WSH, SJ, CAR and TOR. In the West going to go with Ilya Bryzgalov, who has 4 games this week. The Coyotes sit 3rd in the West, but only 5 pts away from 10th, so expect Bryzgalov to play most of their remaining games. In the East going to go with Marc-Andre Fleury of the Penguins, with 4 games this week he will play at least 3 of those games. Benoit Pouliot and Shawn Horcoff led the league in PIMs with 22 minutes each. Cory Sarich led the league this week with a +7 rating, Cam Fowler was the worst with a -8. Tuukka Rask started back-to-back games, and won both. I guess losing to Toronto put Thomas is the doghouse.